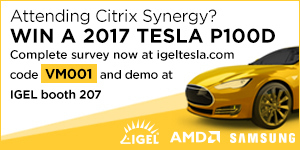 VMblog: As a Citrix Synergy 2017 sponsor, can you give us the rundown of your booth setup this year? FSLogix: FSLogix is in booth 514, and a Bronze sponsor. We're sending 7 people this year including our CTO, who loves talking to IT people and learning more about their business goals and challenges with virtual workspace environments. We'll also have some of our key global partners assisting visitors and doing customized solution demos in our booth. VMblog: And is there anything interesting or unique about this year's booth setup? Do you have a theme? FSLogix: Streamlining management and application delivery, accelerating ROI, and increasing user productivity. VMblog: What message should an attendee take back with them to their boss after visiting your booth? How can they internally sell your technology? FSLogix: Tell their boss what our customers said. Michael Thomason, Citrix administrator and Sr. Systems Architect at Emory Healthcare, commented on FSLogix advanced and innovative functionality, "FSLogix Apps 2 is a game changer. It provides a refreshing, innovative approach to application delivery, image management, application access, user profiles, and solves many of the problems we have tried to solve with application virtualization for many years. It just works! The user profile containers are the best thing to happen to user profiles since they were invented." VMblog: Why should a Synergy attendee add you to their MUST SEE list? FSLogix: FSLogix has had a continual release cadence of solutions that are simple to implement, provide easily measurable, near term ROI, that align with their strategic initiatives around the virtual workspace. As an example, for many years, the Best Practice for XenApp administrators has been to turn indexing off. Now, with FSLogix 2.8, users get a desktop like experience in even the most challenging applications while using XenApp. It is widely known that Folder Redirection is a sub-optimal solution for maintaining users data. FSLogix 2.8 completely eliminates the need for Folder Redirection in XenApp and XenDesktop. Our 2.8 Profile Container solution provides industry leading application launch times, and login times, while reducing profile file corruption and login storms. If you haven't seen FSLogix in action, Synergy is the best time and the best place to stop by for a quick demo to see it in action. VMblog: Your company and team members are pros at Citrix Synergy events, aren't you? FSLogix: Our booth team has a combined attendance of over 60 years. Nuff said. VMblog: What do you like most about Citrix Synergy? FSLogix: Jarian Gibson, Doug Brown, Steve Greenberg, Matthias Schlimm, Christiaan Brinkhoff, Rory Monaghan, Bill Flink, Randy Cook, Theresa Miller, Aaron Parker, Dave Marshall, Brian Ducharme, Benny Tritsch, Jim Moyle, Ruben Spruijt, Tim Mangan, Trond Eirik Haavarstein, Shane Kleinert, and thousands of IT innovators bringing amazing solutions to their customers and end users. VMblog: Can you give VMblog readers a sneak peek as to what you will be showing off at your booth this year? FSLogix: Hint. It has something to do with the number 3. VMblog: Give readers a few reasons why your product or service is considered unique. FSLogix: Our "client only" approach increases session density, reduces single points of failure, and fully leverages existing Citrix and Microsoft technologies such as PVS, MCS, and Active Directory, avoiding costly add-ons and unnecessary hardware. VMblog: How does your company and product fit within the Citrix ecosystem? FSLogix: FSLogix is the perfect complement to XenApp and XenDesktop, that empowers Citrix administrators to reduce the amount of hardware and labor necessary to implement the world class workspace suite. We enable Citrix Application Layering to support multiple versions of applications like Java, plugins, and fonts, all in a single layer, without app-virt. FSLogix is the only solution that seamlessly enables all components of Office 365 in all configuration options of XenApp and XenDesktop, including our latest option to roam OneDrive, OneDrive cache, large files like OSTs, and an industry first that we released at Citrix Summit, the ability to roam Outlook Search for XenApp and XenDesktop. FSLogix Apps provides a single image approach to applications left in the base image, allowing Citrix Application Layering to further reduce the number of images needed in the large, global enterprise. FSLogix: We're looking forward to seeing those awesome VMblog guys in person! VMblog: Hey, I'll gladly take that! And what would you say to prospective attendees who are thinking about attending Synergy but aren't sure if it's worth it or not? FSLogix: Public and private cloud Digital Workspace technology can completely transform the way we work, the way businesses compete, and the way new products and services are delivered. As an ecosystem, we should accept nothing but significant advances that deliver on this promise, and the overall promise of the cloud. The goal is not to be as good as the static desktop, the goal is nothing short of a complete revolution in how valuable information is consumed and created at the virtualized end-point. As a group, we need to engage in real thought leadership - virtualization and the cloud can get desktops and apps to everyone, everywhere. More research, with published results, pushing the envelope, challenging each other, and pushing toward revolutionary, rather than evolutionary change. We need to do to our industry what Netflix did to Hollywood Video. 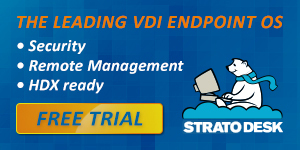 "Virtual desktops everywhere" can deliver innovation and information equity. VMblog: What do you hope to come away with from exhibiting at Synergy? FSLogix: We love bringing revolutionary solutions to market, but what's even more interesting is how the community takes these solutions to the next level in their environment. Synergy is the best place to talk to IT innovators customizing and implementing solutions to the broadest range of end-user types, in every vertical, around the world. FSLogix: Synergy continues to be the best EUC computing show on the planet. Meet as many contacts as you can, fill your schedule with sessions, and hit every booth in the expo hall to see the innovative products and concepts from production and upcoming solutions. You can meet some of the best bloggers and gurus in our industry and get their insight (all while photo bombing their Twitter pictures). FSLogix: We're giving away an Amazon Gift Card to one winner every day, plus our (always popular) 5x7 notebooks for taking notes in sessions and storing business cards, along with some super tiny micro thumb drives filled with all of our stuff, and FSLogix laptop stickers. Many of our registered beta testers are stopping by the booth to pick up their 2017 t-shirts. Make sure you add FSLogix booth 514 to your must see list while at Citrix Synergy. And I love their new, clever T-Shirts!